Whoever said clean eating was boring or bland was crazy. I've been doing so much experimenting in the kitchen and keeping my belly satisfied, along with my taste buds. Protein is a huge part of my diet now, so it's fun finding new ways to eat it. I had a massive sweet tooth the other day, but instead of reaching for a Snickers bar (yummmm), I made a chocolate cake. Best part of this, it was healthy and packed with protein, and took three minutes to prepare. Yep, a healthy chocolate cake in under three minutes. Miraculous, right? Put two scoops of whey protein powder in a coffee mug. Mix in 1 egg white. Mix in 1/4 cup almond milk. Microwave for 2 minutes. Turn mug upside down and pop out the cake. Top with powdered peanut butter (mixed with water to desired consistency), or regular peanut butter. Voilà! 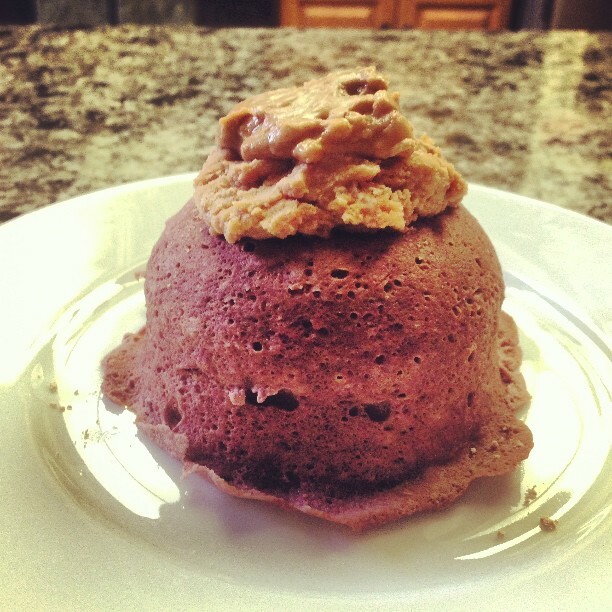 You have a dessert packed with 35 grams of protein. Eat healthy and happy, my friends.